Like the artists of the Harlem Renaissance, African American artists of the late 20th and 21st centuries often focus on the relationship between African art and African Americans. For the majority of contemporary African American artists, they access imagery from Africa through modern Western art which was, after all, influenced by African art in the first place. This is true of an awesome contemporary artist about whom I just learned after we acquired one of his pieces from the Albright-Knox Art Gallery: Willie Cole. While his work is grounded in the early twentieth-century medium of found object, it transcends the mere irony or shock-value sought by Dada and Surrealist artists. 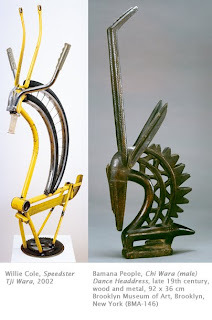 Actually, many of Cole’s found object works have powerful spiritual and cultural connections to sub-Saharan Africa. Such is the case with Speedster tji wara. Cole’s artistic emergence occurred between the poles of the Pop Art of Andy Warhol and Claes Oldenburg and the Minimalism of Donald Judd and Sol LeWitt. Cole’s exploration of racial identity and heritage places him within a remarkable generation of African American artists of the late 1970s and 1980s affiliated by their use of found/existing objects with powerful African American history and nostalgia-laden content. The coming of age of African American artists in the 1970s and 1980s has a direct line of descent from the Harlem Renaissance artists. It was during the period of the Harlem Renaissance that interest in sub-Saharan Africa flourished, a result of the debate among the large numbers of African and African American artists and intellectuals in Paris. Cole’s assemblage of every day objects imbued with banal daily personal energy pays homage to the African practice of veneration of personal objects (for instance, a chair) of the deceased. He is interested in the religion, legends, and spiritual beliefs of West African cultures, particularly the Yoruba of Nigeria. The tji (or chi) wara is a mask from the Bamana people of Mali. The tji wara represents the antelope that the Bamana believed taught humans farming skills. The mask is worn at planting and harvest times to assure good crops. The horns represented the millet stalk, a staple of Bamana life. Cole has cleverly introduced the spokes of the bicycle wheel to represent the zigzag mane of the antelope. The zigzag of the tji wara mask is thought to represent the path of the sun between the summer and winter solstices. The Tamarind Institute’s site features Cole’s work with irons!